As the article will state below, it has been a rule in the infamous Japanese bureaucracy that non-Japanese--and that includes Japan-born ethnic Koreans and Chinese--cannot be promoted into senior, administrative civil service posts. Extending from this is the old Ninkisei ("term limits for foreign academics") chestnut--where non-Japanese cannot legally be given tenure in public and private universities because they are officially government employees. Recent rulings by Japanese courts (which denied an ethnic Korean civil servant--Chong Hyang Gyun, see Asahi Evening News May 17, 1996--the right to be promoted), as well as pressure from the Ministry of Home Affairs (Jichishou), have reinforced this rule. But the republics have been restless: Kawasaki Prefecture earlier this year publicly renounced this rule, noting that it will hire and promote based on qualification, not nationality. 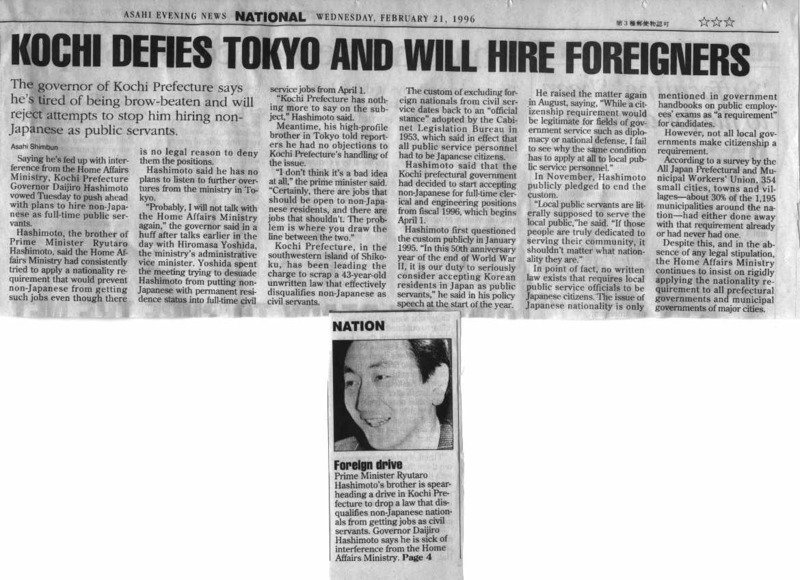 Osaka, as well as Kouchi (in Shikoku)'s governor Hashimoto (brother of our current beloved PM), did the same (see Asahi Evening News, Feb 21, 1996), but soon backed down to "study the matter further" (of course). Meanwhile, the tragedy went on: people who have spent their lives contributing to Japanese society, but had the misfortune to be delineated as gaijin from birth, were thus officially denigrated to permanent peon status in the public job market. Home Affairs Minister Katsuhiko Shirakawa said Friday local governments should decide for themselves whether to hire non-Japanese for general administrative positions. Shirakawa's statement, made at a press conference, was a major departure from the government's "nationality clause" that prohibits local governments from hiring foreigners for administrative positions. Local governments hiring non-Japanese for administrative posts should also inform candidates of any limitations on foreign staff in the areas of promotions and job assignments, the minister said. In May, Kawasaki became the first major city to open up government posts, except in the firefighting field, to foreign applicants. Kochi Prefecture and Osaka city also planned to hire foreigners for government positions in the current fiscal year, but later dropped these plans, apparently in the face of pressure from the Home Affairs Ministry and prefectural and municipal assemblies. The nationality requirement is an unwritten government decree that prohibits non-Japanese from taking examinations to become local public servants. The Cabinet Legislative Bureau announced the policy in 1953 on grounds that foreigners should not hold positions involving the formulation of policies. The Home Affairs Ministry confirmed that stance in 1993 by telling local governments it did not approve of hiring non-Japanese for administrative positions. Although Shirakawa said local governments do not need to consult with the Home Affairs Ministry when hiring non-Japanese, the ministry may intervene depending on the nature of any given case. Now, all this may not mean anything at all. I am not gullible enough to believe that the Japanese political arena is much more than a debate club. The real power here rests with the Administrative Vice-Minister (appointed by fellow bureaucrats, not the PM), who is there regardless of political climate, and cannot be dislodged by anything short of scandal (viz. Health Ministry's AVM Okamitsu and his golf clubs); moreover, he does not need to make policy-directive announcements. Politician Shirakawa may in fact be trial-ballooning--sending up a policy goal to see how it is received by the real policy makers. But whether or not the bureaucrats beyond him decide to hammer out an enforcable statute is another matter. Shirakawa may be reshuffled to another post next year and the directive be forgotten. Moreover, even the article admits that the bureaucrats may intervene if they see fit. If the Home Ministry has as much a stranglehold over policy implimentation as the Education Ministry does in its field, the platitude of "local governments should decide for themselves" has a very hollow ring to it. Still, we must try to acknowledge encouraging news, if only to avoid blinkering cynicism. 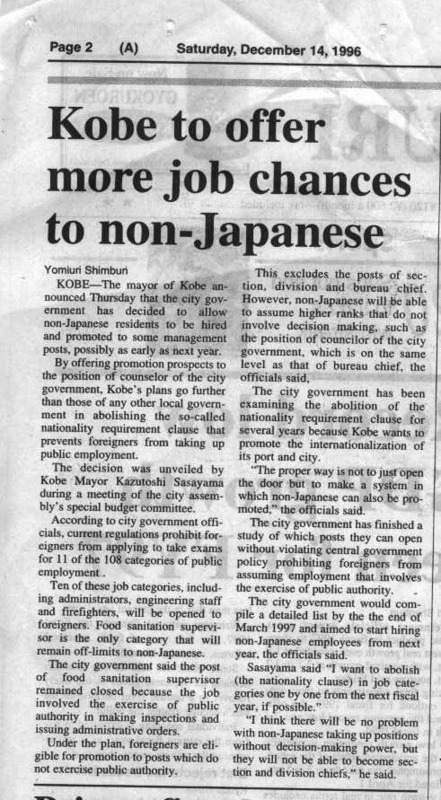 This does put wind in the sails of the rebel prefectures (see Daily Yomiuri Dec 14, 1996, on Kobe City's change of policy shortly after the announcement), and is in principle a step in the right direction. But the results remain to be seen. When we see more national and public schools defying Monbushou and giving their non-Japanese tenure, when we see more ethnicities bossing around their underlings in your local ward office, then we'll know that Shirakawa was actually doing some good, and that PM Hashimoto's promise for government reform was more than just "debate club posturing". Hello Blog. Good news. Local newspaper Niigata Nippou reports that another city government, Jouetsu, intends to abolish the "Nationality Clause" (kokuseki joukou), the guideline, enforced by many local, regional, and national government agencies, that only citizens may hold administrative positions (kanrishoku) in the Japanese civil service. Non-Japanese, even those born in Japan with Japanese as their first language (as generational diaspora of former citizens of empire–the Zainichis), have been systematically excluded from even qualifying to sit examinations for Japan's bureaucracy. Moreover, the Supreme Court decided in 2005, in defiance of Article 14 barring discrimination, that excluding a Zainichi Korean named Chong Hyang Gyun from sitting her admin exam for the Tokyo Government was constitutional! Proponents of the Nationality Clause say inter alia that it is for security reasons, as you apparently cannot allow untrustworthy foreigners (especially those apparently shifty North Koreans) to hold jobs in, for example, firefighting and civil-service food preparation. Hell, you can't trust a foreigner with a fire ax and potential damage to our Japanese property (potential insurance problems and international incidents), and what if they poisoned us during a busy lunchtime and took over! Or if proponents can't be bothered to overthink the situation, they just punt and say that if anyone seriously wants to become a bureaucrat, they should naturalize, as many other countries require nationality for their civil-service jobs. Both of these types of arguments overgeneralize and misrepresent the situation, as opponents point out. Namely, that if Japan had nationality laws like its fellow developed countries, there wouldn't be more than a quarter of a million "Zainichis" lying in legal limbo for five generations now–they would be citizens already and eligible to take the exams anyway. So the Nationality Clause is being slowly been done away with in municipalities (except those with bunker mentalities towards internationalization, such as Tokyo Met). Here's an example: Jouetsu City, on the Japan-Sea side in SW Niigata Prefecture. Bravo. The City Government of Jouetsu made clear on March 27 its aims to completely abolish the Nationality Clause for its 2008 employee hires. Mayor Konoura Masayuki said as such during question time for the city's March regular monthly meeting. Jouetsu City removed the Nationality Clause for employment in the Arts and Child Care in 1995, and from Welfare employees in 2003. From 2008, it will remove the restriction from all city government employment, including civil engineers and construction. As part of its General Plan for Human Rights, drawn up in 2002, Jouetsu had been condsidering abolishing this clause entirely. Mayor Konoura explained, "We wanted to take this up during 2007 entrance exams for employees." The City of Minami Uonuma in Niigata Prefecture also abolished the Nationality Clause for civil-service entrance exams in 2007. The City of Niigata has also indicated that it is considering a similar abolition.